What are key business processes you can outsource to save time and money? For startups and small businesses, trying to do too much all by themselves can quickly become their downfall. For this reason, many smart entrepreneurs try to outsource some tasks to outside companies or freelance workers. No matter what industry your company is a part of, or the kinds of products or services that you sell, outsourcing these 5 core business processes can streamline operations and free up time and energy for improving business growth as well as controlling expenses. 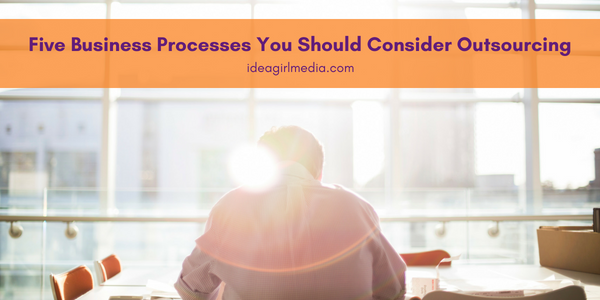 Below are five business process you should consider outsourcing now. Content marketing is vital for most businesses today. It involves the use of easy-to-understand online content which is designed to provide customers with information, answers, and education without coming across as ‘salesy’. Although the main objective of content marketing is to generate leads, it is also often essential for strengthening and nurturing the relationships between your brand and your customers. In turn, this itself can improve your chances of closing a sale. However, most small businesses today don’t have the capital necessary to hire an executive who is directly responsible for content marketing. Hiring a team of freelance writers or outsourcing your content marketing to an agency is a much cheaper option that will help you build better relationships with your audience. If you hire any employees, you’ll need to ensure that all human resources and payroll operations are up to scratch. Given the numerous regulations, laws, and requirements surrounding this area of business, it’s highly recommended that you outsource HR and payroll. Since even one small payroll mistake could cost your business thousands of dollars and lead to tax audits, it’s worth it to leave the job to the professionals. Can prove to be very costly for a small business. The good news is that many of these services can be outsourced. For example, online chat agents can work from anywhere provided they have the right software, such as IT asset management by SysAid and an internet connection. This allows you to outsource the work to freelancers and virtual assistants all over the world, which may enable you to extend your hours of availability. For more in-depth customer issues, consider outsourcing the work to a call center agency that will represent your brand and deal with your customers on your behalf. As a business owner, it’s important to focus on company growth and expansion. As many know, this can quickly be overtaken by smaller, mundane administrative tasks that may be essential, but cut into your valuable time. Instead, outsource admin duties to virtual assistants paid per task handled. The result? Freed-up time to concentrate on improving the bottom line, rather than spending time on these types of business processes. Lastly, it’s always best to outsource the areas that are not your strength. Understanding your own weak points in business will help you get the most from outsourcing and ensure that you are investing your time in the best possible ways. If you found this article helpful, we’d love to hear from you in the comments. ? For some businesses outsourcing all of the IT may be the best option. But there are some that still need the IT department. 6:30 AM Awesome article.These processes really can save time and consider outsourcing. What payroll service would you recommend? It is helpful to know that you feel the processes outlined in the article would save time, and that you believe business owners should consider outsourcing. Payroll services is not my direct area of expertise. Rather than give an un-inclusive answer, I’d rather offer our readers a thorough case study with solid options and insight.